The first five skeins of my new Primrose hand-dyed yarn are up in the shop. There are two skeins of each color, so if you'd like both, convo me and I'll adjust the listing. I haven't put up the spinning fiber yet, but expect to in the next couple of days. Next in line is handpainted Orchid yarn - 100% superwash merino sock yarn. They are dyed and drying. If the last couple of weeks were mostly about the warm colors - reds, golds, etc. - Thursday night was all about the cool colors. Of the 11 skeins I painted, 2 were brown and the rest were greens, blues, and purples. No pictures yet - they're still drying. Soon, though. And I thought my 2 month absense was shameful. 10 months later, here I am again. I've continued to update the shop, just less frequently, and without the blog posts announcing it. I've been completely slacking on the communication. I've started a Twitter account though - it's much easier to post one sentence at a time. :-) I invite you to follow me, DaisySpins, on Twitter. Since last May, I bought many fleece, a new-to-me Majacraft Rose spinning wheel, a motor for my drum carder, and a whole lot of fiber and dye. The real news is that I've really started enjoying the dyeing process, combining colors and seeing what happens. Because of that, I've decided to start officially carrying my own lines of hand-dyed yarn in my Etsy shop. My first offerings will be on my Primrose base - 100% superwash Bluefaced Leicester (BFL) 4-ply sock yarn. I'll also be stepping up my dyed spinning fiber offerings - top, batts, and roving. 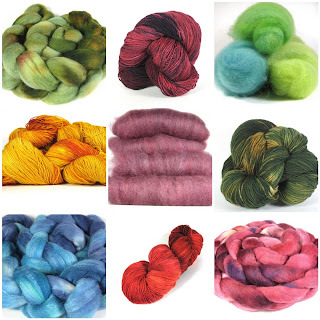 Here are some of the hand-dyed items I'll be offering soon, including BFL, polwarth, romney, and merino/silk top. Look for them on my Etsy shop in the next few days! There's quite a bit of red in there. I definitely go in color phases. Sometimes, I can't get enough green. These days, red. I continue to add handspun yarn to the shop. I've also been experimenting with some less standard spinning styles, including corespun and boucle. I hope to put those up soon too.